Recently, HSBC was pleased to host the first ‘International Brands’ event at its corporate Head Office in London’s Canary Wharf. The objective was to bring together many brands who are looking to expand in the UK through master franchising and a specially selected group of HSBC customers who are looking to expand through this route. The audience consisted of a mixture of established multi-brands, multi-unit franchisees and investors who have a proven track record and expressed an interest in taking on a UK master franchise. The event was well supported with over 75 businesses attending. With support from Johnny Sellyn at whichfranchise.com, seven brands from USA, Mexico, Australia, Denmark and South Africa were identified and presented to the assembled audience. The brands were diverse, but each had a proven track record in franchising - currently operating from a total of over 3000 locations worldwide and demonstrated that their model has the potential for growth within the UK. Andrew Brattesani, HSBC’s UK Head of Franchising commented ‘Each brand had only 20 minutes to make a pitch to our customers so it was important for them to make an impression quickly. They had to provide the audience with an understanding of their brand history, the support the brand provides, expected financial performance and UK store growth expectations so each presentation is detailed and was well received. At the end of each presentation there was an opportunity for customers to ask questions making the event to be interactive’. 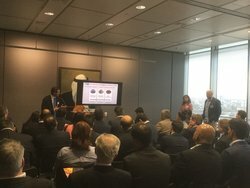 Following the presentations, HSBC hosted a reception on the 40th floor of its Canary Wharf building which was an ideal location for brands and customers to network and start a dialogue. Andrew Brattesani commented ‘The event was an undeniable success and has resulted in a number of UK master opportunities being negotiated. Our customers supported the event enthusiastically and it demonstrated how we can positively contribute to helping them satisfy their growth aspirations and help successful brands identify potential franchise partners’.